Big & Rich | Virginia Credit Union LIVE! 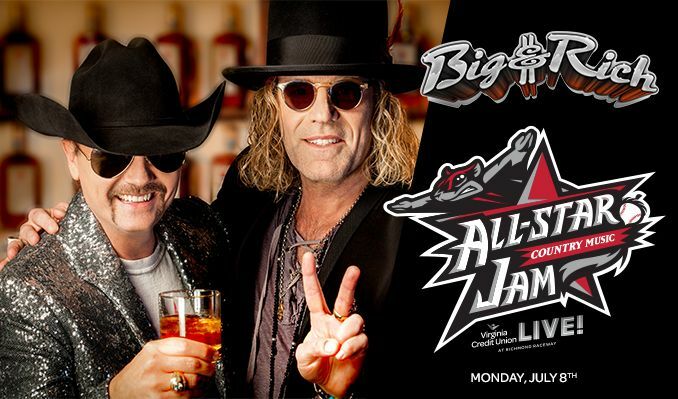 Tickets go on sale on Tuesday, Feb. 12 at 10 a.m. online at vaculive.com, via phone at 866-455-7223, and at the Richmond Raceway Ticket Office at 600 E. Laburnum Avenue, Richmond, Va.
As Big & Rich, John Rich and Big Kenny Alphin have exerted a definite “gravitational pull” to the direction modern country music has taken. Their much anticipated new project, “Gravity” provides a stellar example of the genius of their creative brotherhood--the result of two unique musical personalities colliding to form an even greater positive sum total. They are America's Technicolor cowboys, brothers-in-arms in service to the creed that great music has no boundaries. Individually, John and Big Kenny are first-rate musicians, songwriters, producers, entertainers—and now the creative force behind their own label imprint, Big & Rich Records. Together, they are one of the most truly original musical forces ever unleashed on a welcoming world. Big & Rich have, of course, made a career of being relatable and musically relevant since exploding into the public consciousness in 2003 as the rarest of breeds—true country music game changers. With 2004’s triple-platinum Horse of a Different Color, they were able to tap into the best strands of a wide spectrum of popular music, filter them through their pens and voices and produce a sound that is instantly recognizable, if not classifiable. "You still can't really define what that sound is," says John. "Even we can't." It begins, of course, with that one-of-a-kind vocal blend, as unique and compelling as any in the history of the popular airwaves. "I listen to a lot of music and I haven't heard any two voices go together like this," says Kenny. "John and I can match each other anywhere. He can sing anything and I can make an entirely different melody around it, and vice versa." If radio didn't fully know what to make of them at first, fans of every musical stripe did. They packed arenas with a flying circus of sight, sound and spectacle, a touring renaissance fair of the mind, complete with raised glasses and danceable beats. With a much anticipated new studio album that finds them at the top of their creative game, their live performances find them at their hell-raising best, with crowds as intense and appreciative as any they've ever faced. "It seems like when you put John and Kenny together and we become Big & Rich, it's like Clark Kent walking into the phone booth and coming out a superman," says John. "We can't explain it. It's like a chemical reaction between Kenny and me on stage, something you can feel there. It's funny to think about but it's really true, we walk out on stage and start laying into this thing, the energy goes back and forth between us and the crowd and it's palpable." They are, in addition to everything musical, noted philanthropists and good-will ambassadors. Both remain committed and enthusiastic livers of life and givers of time, talent and fortune to great causes. Kenny has become a world traveler, fighting poverty and supporting education through agencies including the United Nations Foundation and the Red Cross from North America to Africa. John takes part in any number of charitable outreaches, and his win on The Celebrity Apprentice brought well over a million dollars to St. Jude Children's Research Hospital. Those things go to the core of two men whose music and worldviews intersect seamlessly. "We continue to try to inspire," says Kenny. "We just try to be ourselves in a world that sometimes insinuates you shouldn't go outside the boundaries. And now the fact that we've got the family thing going on has made a tremendous difference for both of us, but we're still the same guys. I think life in general moves you forward in a positive way if you let it. Our relationship has grown more positively here than you could ever imagine. I think we just continue to grow, to respect each other more and more and respect the kind of ability we have when we're singing together." "We both have a lot of things that we do creatively," adds John, "but there's been something magical about this since the beginning. As good as we are at what we do separately; neither of us is as good as Big & Rich are together. The Big & Rich thing is like a new color in the crayon box." "No question in my mind," says Kenny, "that we have put forward as high quality music as we can do. And we believe we just keep getting better."